Friday, January 28, 2011 we wrote about our EI papers, but then Saturday, February 19, 2011 we had to backpedal on the accessibility of the papers. Today we are happy to announce that with the generous support of our lab director who is sponsoring the page charges, we are able to make the fuchsia paper open access. Colors are often named ad hoc, like in the image above. In the fuchsia paper, we derive the correct method to elicit color terms. In a second part, we report on the calibrated lunch experiment, where we show that color terms elicited from emissive samples like those from crowd-sourcing correlate very well with those elicited from reflection samples like those used in the World Color Survey. Here is the link to the paper: http://dx.doi.org/10.1117/12.872581 (the button to download the PDF is on the right). The slides are still in the post of Tuesday, January 25, 2011. 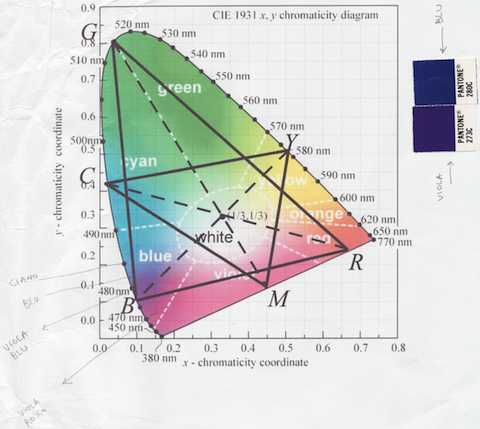 Typically when we begin a career in computational color science, we start from colorimetric color reproduction. As we explore the wide variety of device gamuts, we quickly progress to perceptual color reproduction. At the latest when we build shippable product, we have to progress to preferred color reproduction. Circadian rhythms are linked to the external light-dark cycle through inputs from photoreceptors that signal into networks that regulate neural and physiological function. One of the key photoreceptors is CRYPTOCHROME, which is sensitive to blue-light wavelengths. Fogle et al. now find that CRYPTOCHROME has an unexpectedly direct effect on circadian physiology in fruit flies. A small group of neurons that are part of the circadian circuit and that are usually more active in the morning express CRYPTOCHROME. These neurons normally receive plenty of input from the circadian circuit that perceives cycles and drives responses. However, when those inputs are blocked, it seems that these neurons are able to respond directly to blue light. Materials scientists at UC Santa Barbara have used quantum mechanical calculations to solve a riddle known as "LED droop," viz., the drop in efficiency that occurs when nitride-based LEDs are operating at the power sufficient to illuminate a room. The droop phenomenon is associated with Auger recombination in semiconductors; a variant of the Auger effect, known to chemists and spectroscopists. The UCSB researchers discovered that indirect Auger effects, which involve scattering processes, account for the discrepancy between the observed droop and the predicted droop, Previous theoretical calculations only took into account direct Auger processes. Researchers at the University of Basel have discovered that computer screens with a LED backlight unit (BLU) have a greater effect on a person's sleepiness and cognitive performance, as compared to other types of BLUs. LEDs emit more energy at a wavelength of around 464 nanometers, which has a strong effect on the circadian hormone melatonin's level as well as on cognitive performance. Tests showed that people who sat in front of an LED display for five hours in the evening had a 20% faster reaction time and had better cognitive abilities according to other tests as well. The researchers suggest creating BLUs with a variable spectral power distribution so that sleep cycles are not disturbed. If you are an avid video gamer, consider upgrading to an LED display. Read the article at this link: http://tinyurl.com/03-110325. Source: Science-Switzerland, February – March 2011. 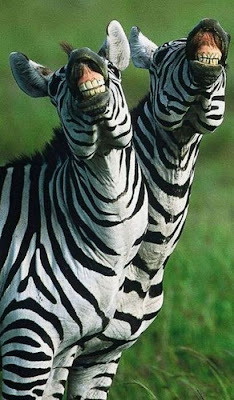 Do you know where your pet zebra is right now? Every zebra owner lives with this constant worry. Now, you can have that complete peace of mind you've been longing for and continue to watch TV. Let a computer find your zebra. Researchers at Princeton and UI Chicago† have developed Stripe Spotter, which treats the zebra's individual stripes as a form of barcode. You start by adding some of your most cherished photos of your pet zebra (assuming you have taken some) into the stripespotter database. I don't know about you, but I've already downloaded the software and plan to apply it ... just as soon as I locate my zebra to take its photo. † M. Lahiri, C. Tantipathananandh, R. Warungu, D.I. Rubenstein, T.Y. Berger-Wolf. "Biometric Animal Databases from Field Photographs: Identification of Individual Zebra in the Wild," Proceedings of the ACM International Conference on Multimedia Retrieval (ICMR 2011), Trento, Italy, 2011. Please try the game below. There are eleven variations possible, one of which is randomly selected when the page or experiment is loaded. More details on the game to follow. Suffice to say these are games with hypotheses. Thanks and best. This is a genuine photograph, not a Photoshop job. Expat Kiwi, Denis Smith, explains how he does it in this video interview. 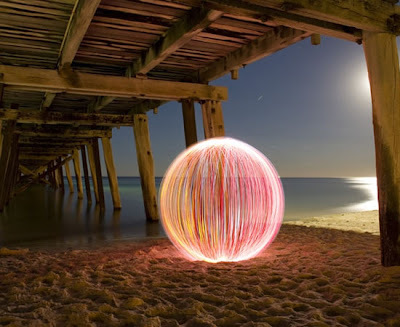 Like the other images on his "Ball of Light" web page, the backstory is also very compelling: reaching a mid-life crisis while working for Fuji Xerox and purchasing his first camera less than two years ago. The coset G / H of a continuous Lie group G by a closed subgroup H is a manifold of dimension given by dim(G) − dim(H). which is the 2-sphere approximated in the above photo. From the standpoint of Lie groups, "Sphere of Light" would be a more accurate name for Smith's project.